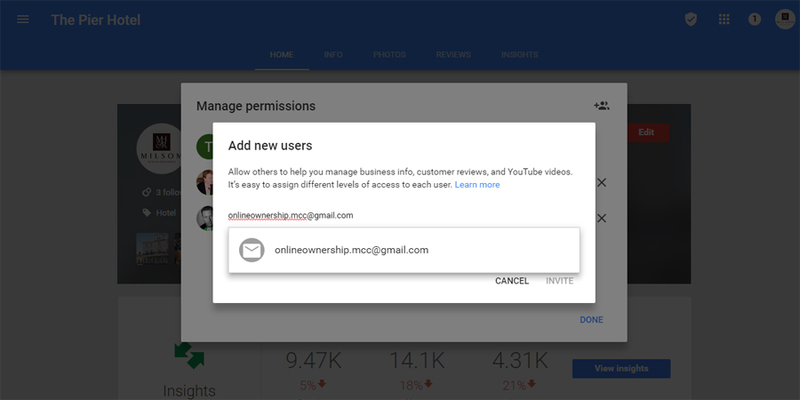 With the recent update to ownership settings of Google Business Pages the process of transferring ownership of a business page has changed slightly. 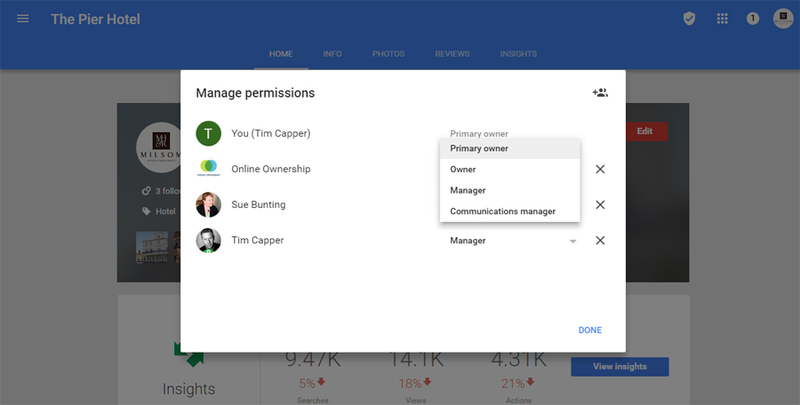 Previously you had to add a user as a manager of a business, then wait 24hrs before being able to transfer the ownership of the page, the new update allows you to add multiple owners or transfer primary ownership immediately. 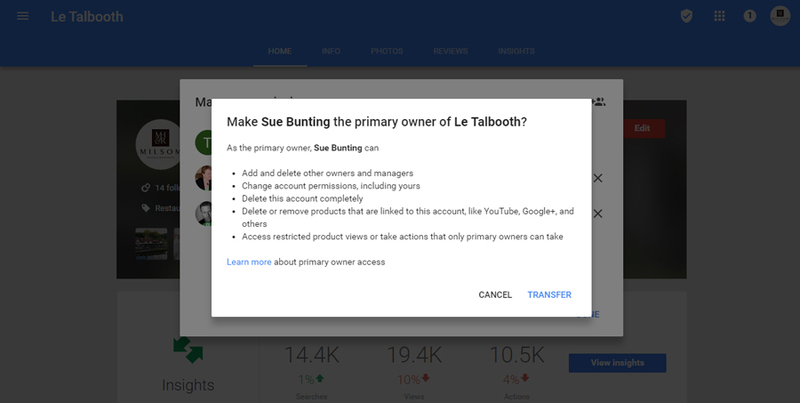 Follow the steps to transfer the ownership of a Google business page to a new owner as well as transferring ownership to an existing manager. 1. 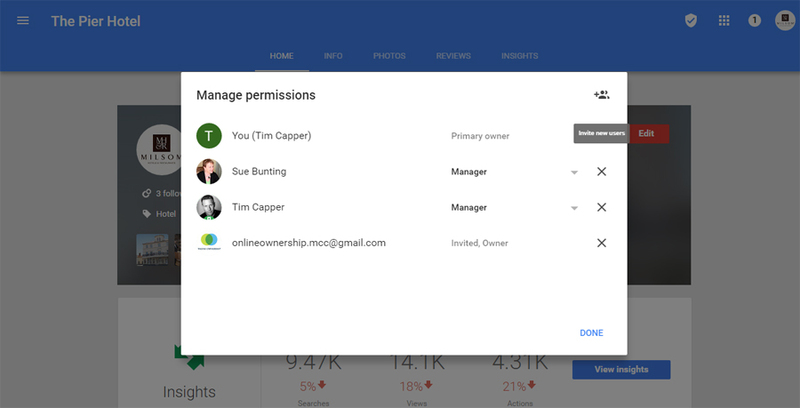 Log into your account dashboard: https://business.google.com/manage/. Select the location you wish the manage – Manage Location. In the drop down hamburger menu (Top Right) select Manage Users. 2. A Manage Permissions pop up will appear detailing the current permissions. It will list the current Primary Owner and any managers, communication managers assigned to the page. Select the Add Users icon. 3. A new pop up will appear asking you to Add New Users. 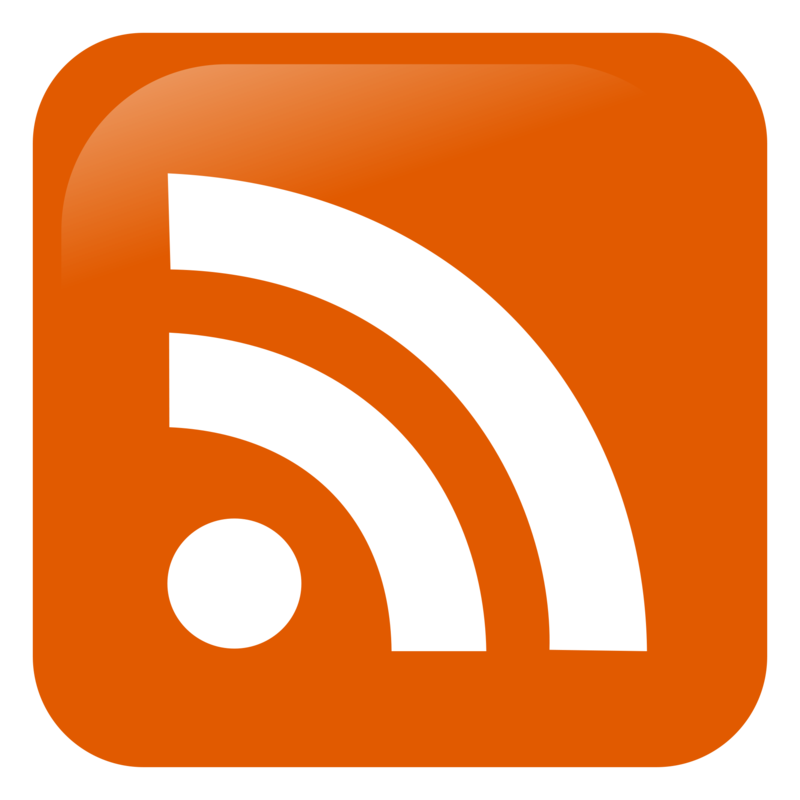 Add the email address of the user to whom you wish to transfer ownership to. 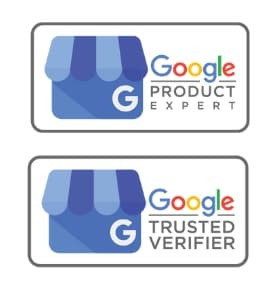 The email address you add needs to be a registered Google user, it can either be a gmail account or their own email, but this needs to be activated as an email account with Google. 4. 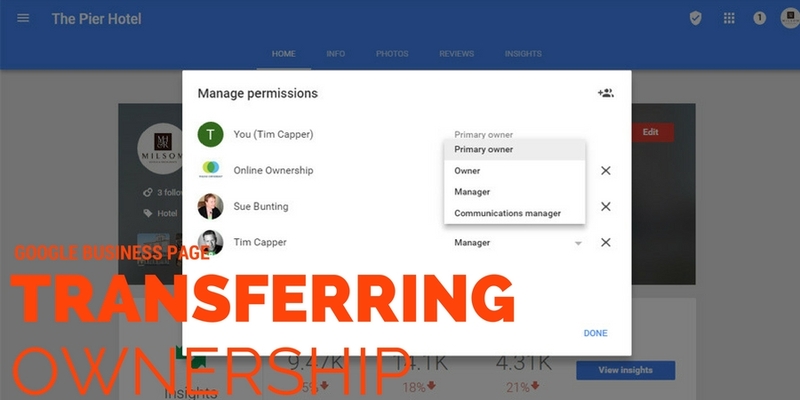 Assign the new user Owner permission. Then click Invite. 5. 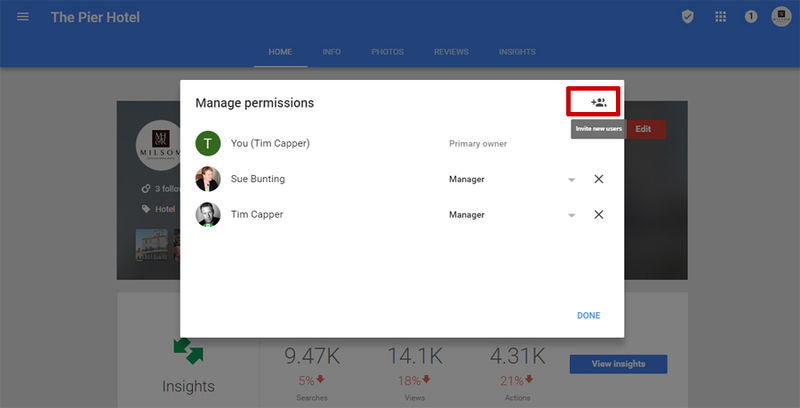 The Manage Permissions page will now show the new user as Invited and the assigned role. 6. 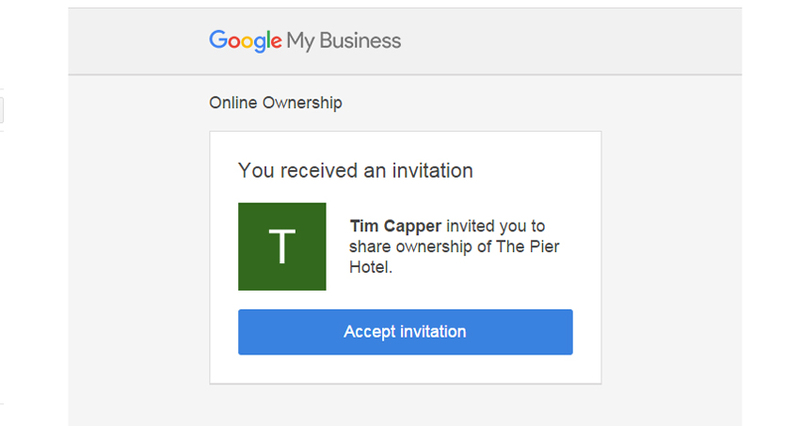 The invited owner will now be sent an email inviting them to become an owner of the Google Business Page. The user must accept the invitation before permission is activated. 7. Once the invite has been accepted by user, you are now able to switch the permission assigned as Owner to Primary Owner. The new primary owner can now remove the previous owner and the transfer of ownership is complete. Transferring ownership to an existing manager follows the same path with the exception of the invitation. 1. 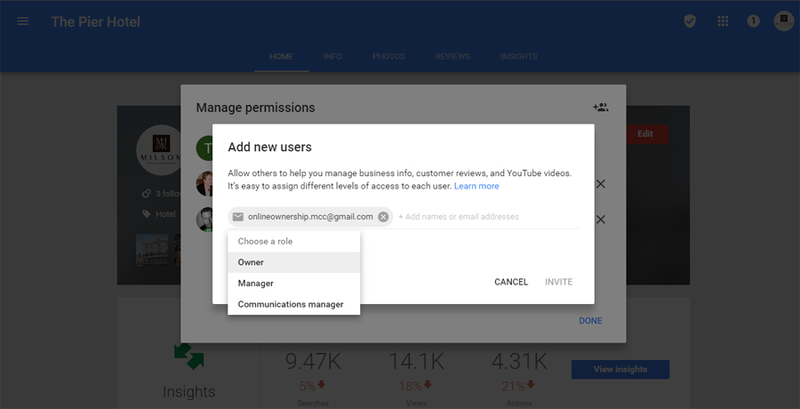 Log into your account dashboard: https://business.google.com/manage/. In the drop down hamburger menu (Top Right) select Manage Users. 2. 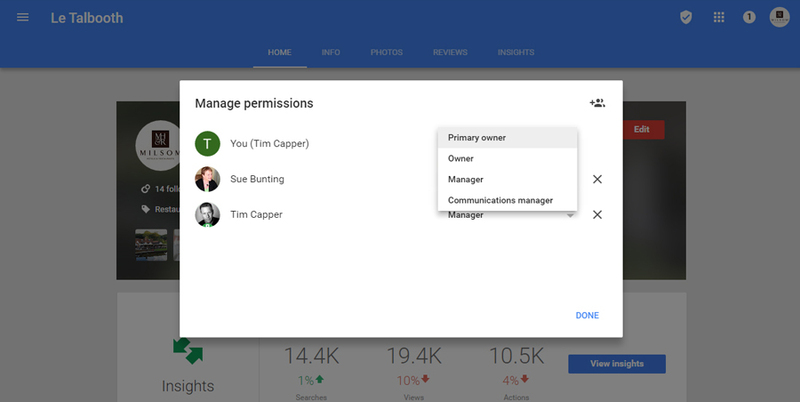 A Manage Permissions pop up will appear detailing the current permissions. It will list the current Primary Owner and any managers, communication managers assigned to the page. 3. Change the permission from Manager to Primary Owner. 4. Confirm you wish to assign Primary Ownership to user. Once confirmed the previous manager is now the Primary Owner of the business page.